The image in this post is a metaphor for what this year is all about so far: the Work Around. I know that the ideal way to wear a Nike is to wear a sock that is intact. 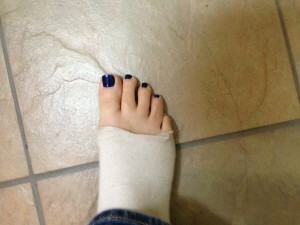 However, on the 3rd day of school I arrived with my right foot seemingly bound like a geisha’s. Upon examination during my prep period, I realized that I had somehow grabbed my 7 year-old’s sock and threw it on in my haste to get out the door quickly. So what did I do to solve this uncomfortable problem? I cut the top of the sock off. I made it wearable, sure. But it also looked ugly behind the scenes and still made for a sweaty-foot-kinda-day. My new shoes impressed, but if you had just pulled back the curtain by one layer, you would have seen the MacGyvering necessary to get through the day without doing serious orthopedic damage. This experience has suddenly, for me, become a metaphor for our start of the year and all the work arounds needed to just seem like we were ready for the opening of school. I don’t know what happened, but I assure you, the teachers were prepared. Our rooms were ready, many were thematic and created an exciting environment of learning to come. Our policies were clear, ready to be presented and practiced during our first few days. Our routines and rules ready for unveiling. Many, if not most, had come in early to prepare our spaces and our curriculum in order to start teaching from the starting line of that first day. Unfortunately, it seemed everything beyond our rooms, and much of what was beyond our control or the control of our school/district, was less-than-ready. Workbooks, textbooks, supplies, emergency handouts, student agendas, the attendance program, the grading program, even in many cases, student schedules themselves…all of them glitchy and had balls dropped in one kind or another. Some was budgetary, some the victim of faulty prioritization. For whatever reason, the whole school, knowing how important those first few days were, designed Work Arounds. It’s not ideal, and with a mere glance around the curtain, one could see the hamsters that were the teachers and admin running on the wheels and keeping things afloat. Look, it isn’t that educators shouldn’t always have a Plan B in their pockets. But there is a contract with our districts, with our states, and with our federal government, that we won’t have to function on Plan B, C, & D and still be held accountable for the level of success we want to provide. It’s like pitching a program that costs X-amount of money, that’s research-based and proven successful, and being given the green light, only to be told that you have only 1/3 of the money necessary to launch the program. Then, you’re told the plug was pulled because the program didn’t prove AS successful as stakeholders had hoped. In the era of the Work Around, I have to ask: should schools who aren’t given the budgets or the authority to make changes in procedures, staff, and line items be held accountable for ideal results? Additionally, should teachers who are forced to function in Work Arounds be held accountable for ideal results? Taking this a step further, many have already questioned the lack of ideal circumstances students find themselves in (be it from poverty or abuse, etc…), and whether they too can, on a mass scale, produce the ideal results we all wish for. We all continue to try, we all continue to peddle on a bike like Gilligan himself, generating electricity from our own muscles and sweat, but at what point is it too much to ask? For those educators who find themselves being taken for granted for covering up all-too-well the imperfections of The Work Around, I’m not sure what to say. We can’t NOT do what we do as well as we can. We can’t see the wine bottle topple over onto the white carpet and NOT reach for it in good conscience simply because society assumes we’ll be there to grab it. Otherwise, we become the villains. But we do have a responsibility to let people know that The Work Around Plan D is becoming the go-to reality known as Plan A. The start of the year is important. We all know that. It sets the tone of the year for classroom management, the craziness that can be the front office, and of course, student achievement itself. But students smell blood in the water immediately if they sense scrambling. Even the most flexible of teachers know how important the first few days can be. But here’s the thing: there are only so many work arounds in one’s pocket before that pocket becomes empty and the brain is tapped out. You need some time to regroup and regain your manna so you can design work arounds on the fly again. However, if the need to design work arounds hits you again and again and again, you never get that opportunity to recharge. Be it teachers or schools or districts…they cannot function indefinitely in The Work Around. I’m sure that’s what it feels like as an admin with few resources. And I know that’s what it feels like as a teacher who shows up to work without some of the key elements needed to teach in place. And in our business, the deep concern is that if schools and teachers are forced to function in Work Around conditions, then our student and family clientele will also come up with their own Work Around…jumping ship. ??????? eta ??? - ??????? eta ??? ???????????? ???????????????????????????????????????????????????????????????iwc???????????????????????????????????????????????????????? ?